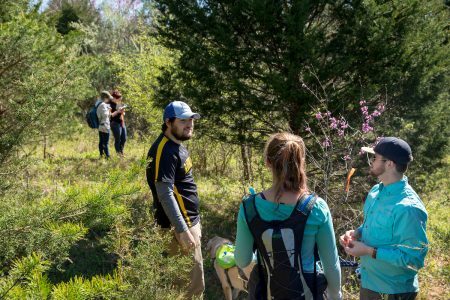 Students conduct research on trees and plant life in Natural Bridge State Park. Randolph has once again been named a “Cool School” by the Sierra Club. The College was one of 227 higher education institutions across the nation and only one of a handful in Virginia to earn the recognition in 2017. Sierra magazine’s Cool Schools ranking is open to all four-year, degree-granting undergraduate colleges and universities in the United States. Sierra scores and ranks participating schools based on data in a variety of categories. Randolph was ranked 179th on the 2017 list. Sustainability Coordinator Sara Woodward said Randolph scored particularly well in the academic and co-curricular activities categories, and its bike share program and rain gardens helped the College earn high marks in transportation and water. Also, from 2014 to 2016, Randolph reduced its water use per square footage of building area by 14 percent. To compile this year’s rankings, Sierra used a Sustainability Tracking, Assessment & Rating System (STARS) to give colleges and universities a method for tracking and assessing their sustainability programs. This is a self-reporting survey designed to help higher education administrators understand all aspects of campus sustainability and to compare their progress with other schools. See the complete Cool Schools list at http://www.sierraclub.org/sierra/cool-schools-2017/cool-schools-2017-full-ranking.